Our experience has shown that high levels of activity and human interaction result in happier and healthier pets; especially when they are away from home. 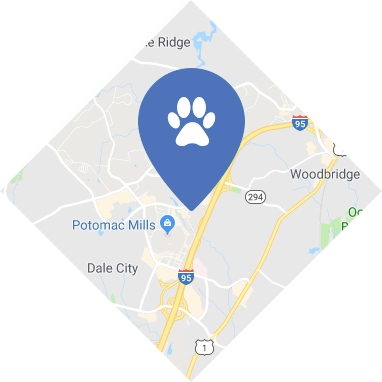 We take the time to get to know you and your pet, so we can help you select the appropriate level and types of activities that will suit your pet best! Our Activity Packages include playtimes, gourmet treats, and individual attention provided each day of the stay. We look forward to getting to know you and your furry family member and welcoming you as members of the Dog Eaze Inn family. We provide special activities to ensure that your pet is happy and engaged. The amazing pet care team at The Dog Eaze Inn is made up of pet lovers who are trained in dog body language, dog behavior and pet safety. 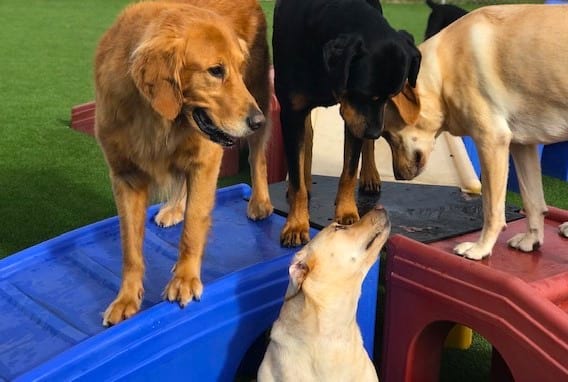 This expertise allows us to conduct a behavioral assessment of each new guest, and then special care is taken to place dogs in the appropriate playgroups based not only on size, but temperament and playstyle as well. Dogs who prefer human friends over canine friends enjoy private playtimes and pampering sessions with a member of our pet care team. All activities take place in one of our 7 spacious outdoor play yards, or in one of our indoor playrooms during inclement weather. Additional business walks are available for dogs who are accustomed to or require more frequent potty breaks. We will work with you to match your pet’s daily routine at home, with additional morning, noon and evening business walks available. Your dog will love our all natural frozen yogurt flavored with real fruit (banana, and strawberry) or peanut butter! This is a a cool, refreshing and healthy treat for your furry family member! Additional time to engage with our pet care team helps dogs feel right at home. Indulge your precious pet with a bedtime story and tuck-in session. The sing song rhythm of a story book combined with a belly rub and a homemade cookie treat will prepare your dog for a night of peaceful sleep, and give you that extra peace of mind that he or she is happy and content while you’re away. Our Bedtime Story and Tuck-In service provides the perfect ending to a fun-filled day. Or whatever you pet enjoys most!